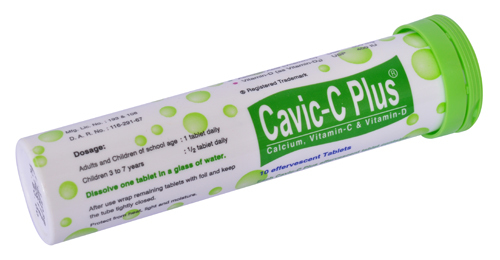 Cavic-C Plus effervescent tablet: Each tablet contains Calcium Lactate Gluconate USP 1000 mg, Calcium Carbonate BP 327 mg, Ascorbic acid (Vitamin-C) BP 500 mg and Vitamin-D3 4 mg (eq. to Colecalciferol BP 400 IU). •As alkalizing agent in conditions with systemic acidosis. The use of Calcium supplements has rarely given rise to mild gastrointestinal disturbances, such as constipation, flatulence, nausea, gastric pain and diarrhoea. Following administration of Vitamin-D supplements occasional skin rash has been reported. Hypercalciuria, and in rare cases hypercalcaemia have been seen in long-term treatment with Vitamin-D at high doses. Patients with mild to moderate renal failure or mild hypercalciuria should be supervised carefully. Periodic checks of plasma Calcium levels and urinary Calcium excretion should be made in patients with mild to moderate renal failure or mild hypercalciuria. In patients with a history of renal stones urinary Calcium excretion should be measured to exclude hypercalciuria. With long-term treatment it is advisable to monitor serum and urinary Calcium levels and kidney function, and reduce or stop treatment temporarily if urinary Calcium exceeds 7.5 mmol/24 hours. Allowances should be made for Calcium and Vitamin-D supplements from other sources. During pregnancy and lactation treatment with Cavic-C Plus should always be under the direction of a physician. During pregnancy and lactation, requirements for Calcium and Vitamin-D are increased but in deciding on the required supplementation allowances should be made for availability of these agents from other sources. Overdoses of Vitamin-D have shown teratogenic effects in pregnant animals. Vitamin-D and its metabolites pass into the breast milk.